A path is leading us into the inevitable, but there is a way out! This is a book that you will want for yourself and your loved ones. Over 10 million copies in print! We believe the most significant book of our time, brings the reader, step by step, down the centuries - to the present hour. Here you will find a sweeping view of history, with staggering implications for our own time! Over 700 pages. First copy FREE! Additional copies - $2.00 + $1.25 S/H. 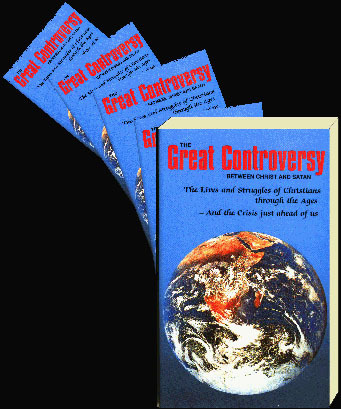 IF YOU WOULD LIKE TO RECEIVE YOUR COPY OF "THE GREAT CONTROVERSY" ABSOLUTELY FREE, PLEASE JUST FILL OUT THIS FORM (USA RESIDENTS ONLY, PLEASE). IF YOU EXPERIENCE PROBLEMS WITH THE FORM, PLEASE E-MAIL US YOUR NAME AND ADDRESS AT presenttruth4@hismarvelouslight.com. YOUR FREE BOOK WILL BE SENT THE SAME DAY! THERE IS NO HIDDEN COSTS (ie. shipping costs, etc.)! THERE IS NO FUTURE OBLIGATION! AGAIN, WE ARE SORRY, BUT WE CAN ONLY SEND THIS TO RESIDENTS OF THE UNITED STATES, DUE TO HIGH INTERNATIONAL SHIPPING COSTS.